Microsoft's infrastructure is responsible for a huge percentage of global enterprise email, both on their cloud based Office365 service - and through their on-premise Microsoft Exchange Server solutions, heavily popular with the public sector and private alike. Their live.com service (formerly Hotmail) is a well known free platform too. What exactly are we dealing with - and what do you need from us at Deskpro? OWA is a browser based web app - through the years it has existed plainly as "Outlook" or "Outlook on the Web". It is an email client, similar to the Microsoft Office Outlook, or competing software such as Mac Mail, Mail App and Thunderbird - except accessible from any computer through a web browser. You visit OWA to check your email on the go. EWS is a different concept. 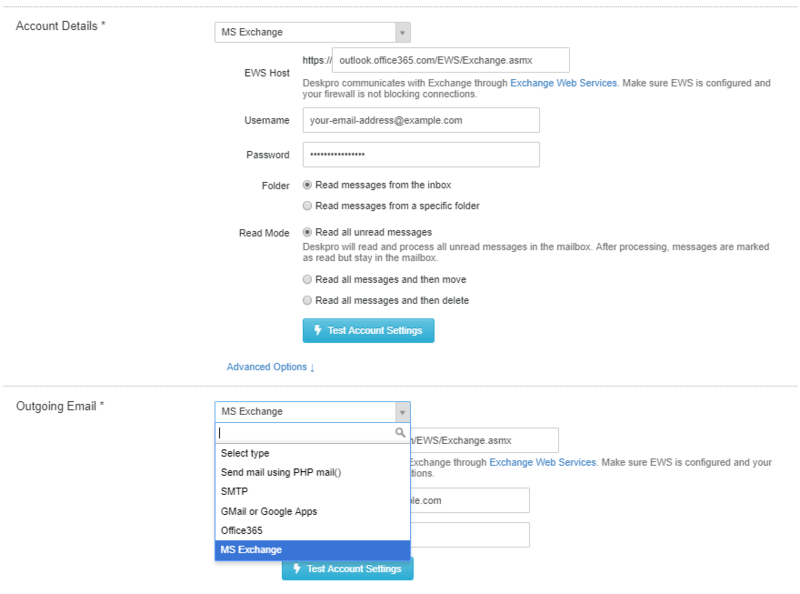 This is a backend, and non-end user facing service tool exposed to the internet so applications, such as Deskpro, can connect into Office365 or an private Exchange system to relay email. It is referred to as an API (Application Programming Interface) - allowing programmers to integrate calendars, contacts and other aspects beyond just email relay. It is not something an end-user would ever access day to day. What do I need for to send mail through Deskpro on-premise? We use Office365, how do I access EWS? As a hosted cloud platform, each Office365 user connects to the same EWS URL. Where do I set this up in Deskpro on-premise? You set this up in the same way you would any other email account. Instead you would enter the EWS address without the https:// - enter your desired email address and password - and Deskpro will handle the rest. You are afforded plenty of flexibility in how Deskpro on-premise handles the incoming email. I hope these answer any doubts you have about the Exchange/Office service, and its compatibility with Deskpro on-premise. If you have any further questions, please reach out to our support team.